Rank and organization: First Lieutenant, U.S. Marine Corps Reserves. 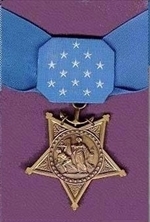 Citation: For conspicuous gallantry and intrepidity at the risk of his life above and beyond the call of duty as Executive Officer of the 2d Battalion Shore Party, 8th Marines, 2d Marine Division, during the assault against enemy Japanese-held Tarawa in the Gilbert Islands, 20-22 November 1943. Acting on his own initiative when assault troops were pinned down at the far end of Betio Pier by the overwhelming fire of Japanese shore batteries, 1st Lt. Bonnyman repeatedly defied the blasting fury of the enemy bombardment to organize and lead the besieged men over the long, open pier to the beach and then, voluntarily obtaining flame throwers and demolitions, organized his pioneer shore party into assault demolitionists and directed the blowing of several hostile installations before the close of D-day. Determined to effect an opening in the enemy’s strongly organized defense line the following day, he voluntarily crawled approximately 40 yards forward of our lines and placed demolitions in the entrance of a large Japanese emplacement as the initial move in his planned attack against the heavily garrisoned, bombproof installation which was stubbornly resisting despite the destruction early in the action of a large number of Japanese who had been inflicting heavy casualties on our forces and holding up our advance. Withdrawing only to replenish his ammunition, he led his men in a renewed assault, fearlessly exposing himself to the merciless slash of hostile fire as he stormed the formidable bastion, directed the placement of demolition charges in both entrances and seized the top of the bombproof position, flushing more than 100 of the enemy who were instantly cut down, and effecting the annihilation of approximately 150 troops inside the emplacement. Assailed by additional Japanese after he had gained his objective, he made a heroic stand on the edge of the structure, defending his strategic position with indomitable determination in the face of the desperate charge and killing 3 of the enemy before he fell, mortally wounded. By his dauntless fighting spirit, unrelenting aggressiveness and forceful leadership throughout 3 days of unremitting, violent battle, 1st Lt. Bonnyman had inspired his men to heroic effort, enabling them to beat off the counterattack and break the back of hostile resistance in that sector for an immediate gain of 400 yards with no further casualties to our forces in this zone. He gallantly gave his life for his country.